Overall: Ayton is one of the most physically & athletically gifted and NBA ready players in the draft. Ayton plays quickly and should have no problem adjusting to NBA tempo/pace. He is efficient with minimal dribbles, which is something that I think will help him immediately be effective in the NBA. At Arizona, he practiced against guards to work on quickness and staying with quicker players on perimeter defense, which earned him the hustle jersey under Sean Miller in practices. His primary areas of improvement are in rim protection and 3 point shooting consistency. Whether the reason for subpar rim protection from Ayton is because of effort or instincts, the unknown issue given his length is worrisome, especially considering that center is arguably the most important position defensively. I lean towards thinking the defense is an effort issue, which can be concerning, but also shows potential improvement. However, this does not mean he is a bad overall defender- he was voted on the All PAC-12 Defense team. DeAndre Ayton has already shown great patience on defense and can go vertical at the basket. Ayton also has incredible lateral quickness for his size, which helps him be one of the best perimeter defenders of the bigs in this class. As for his jump shot mechanics, his jumper gets less arc as he goes further away from the basket. However, his mid range shot and free throw form show significantly more promise and room for growth. 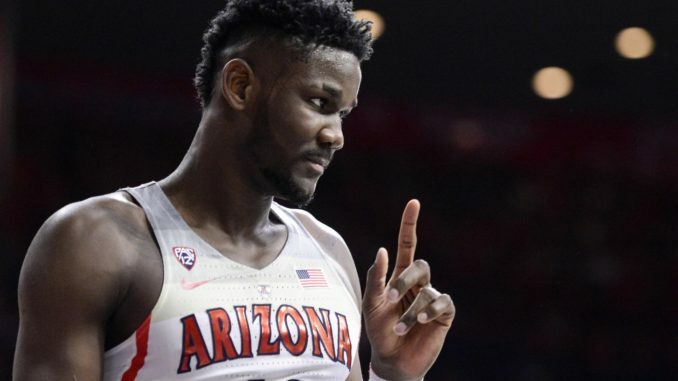 Ayton shot just 17 NBA 3s this season in Arizona and made just 3 of them. Ayton also shot 79.8% at the rim with Arizona. Ayton’s skill development should come rather easily since he doesn’t need to spend a lot of time in the weight room, thanks to his advanced NBA body for his age. This will allow for more time on skill development in areas such as defense, jump shooting, and ball handling. Ayton has all the ingredients to be a star in the NBA, which makes him the favorite to go #1 overall in the 2018 NBA draft. Ayton possesses an excellent NBA body, he’s an elite athlete for his position, and he has all the tools to be a unicorn. Ayton is still just 19 and will be a fresh 20 for the start of his rookie year. Fit with the Mavericks: The Mavericks’ biggest needs are big man and athleticism- both of which Ayton addresses. Ayton would instantly become the cornerstone of the franchise along with Dennis Smith, and would also allow for Harrison Barnes to fill a better role for winning basketball. However, with the Mavericks owning the 5th pick, the Mavericks would need to trade to the #1 pick in order to acquire Ayton, which is very unlikely. Fit with the Suns: The Suns are likely to choose Ayton, as they scouted every home game and just about every game of his season in 2018, and they own the #1 pick. Ayton fills the hole at center in Phoenix and also gives Devin Booker another franchise cornerstone to work with. While the Suns have had defensive effort issues over the previous two seasons, and Ayton isn’t an immediate answer to that issue, but Ayton should be able to adjust well on both ends to NBA spacing as his career progresses. With Tyson Chandler entering his final year of his contract, Alex Len likely gone, and impatience with Dragan Bender and Marquese Chriss, Ayton may be the answer the Suns have been seeking in the last few years as a big man cornerstone. Ayton, Jackson, and Booker all excel in different areas that should be able to coexist and be fluid together. Additionally, with TJ Warren growing as a scorer, the pressure for Ayton to be an offensive weapon should be weighed down with two 20 point scorers playing next to him. Additionally, the Suns have little shot creation from their centers. Ayton has sufficient ball handling and should grow in that area, in order to create his own offense, as well as to create offense for his teammates through both pick & rolls and passing. If you want even more detail on my perspective of DeAndre Ayton, you can read a writeup I posted early in the college season after games vs Purdue, Texas A&M, and NC State in the Battle 4 Atlantis Tournament. You can also follow me on Twitter and Instagram @MavsDraft.